At Hampton our priority is that children have got to be safe and also feel safe! Keeping children safe is everyone's responsibility; a culture of vigilance and care is embedded in our day to day practice at Hampton and training at every level to ensure safeguarding policies and requirements are fully understood. We are committed to maintaining children's welfare and strive to provide an environment in which children feel safe, secure, valued and respected; confident to talk openly and sure of being listened to. If you are worried or have any concerns, the Designated Safeguarding Lead (DSL) who has overall responsibility for child protection practice at Hampton is Ms Yvonne Nunn (Headteacher). In the absence of the Lead DSL, Mrs Norman and Mrs Stephens are to be informed of any concerns you may have as Deputy DSLs. keep up to date with your children’s use of technology can be a challenge. education to ensure their protection, and they become responsible users of technology. 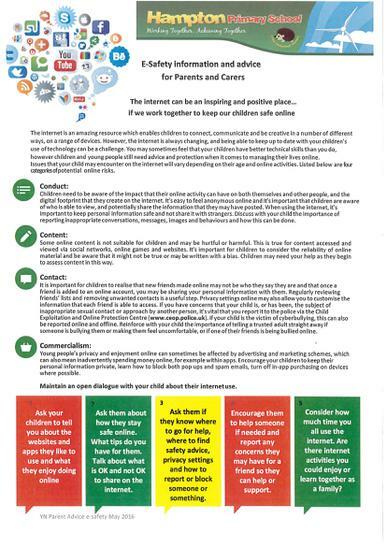 help you to provide advice and protection in keeping your child safe online. At Hampton Primary School we have an acceptable users policy which can be found on link below. the whole family, you can learn and have fun together using the internet. they might see, what they share, who they talk to and how much time they are spending online. for your child. Encourage them to use sites which are fun and educational. Keep up to date with your child’s development online. Children acquire skills quickly and explore freely. to aid keeping your child safe. 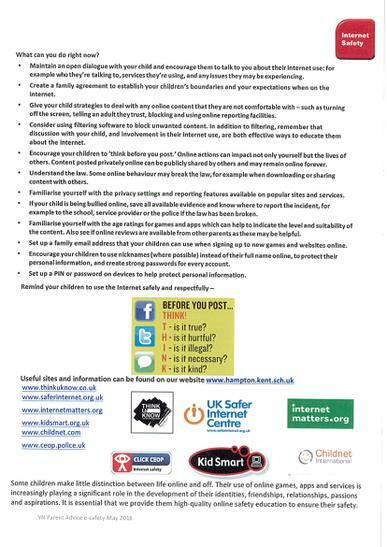 School Policies View school policies on Safeguarding (Child Protection) and E-Safety and Internet. Wellbeing Team Our Wellbeing Team are here to offer specialist help, support, advice. CEOP Internet Safety News and articles surrounding internet safety. Cyberbullying A great document for all parents and carers is this advice from the Department for Education. Internet Matters All you need to know about internet safety for you and your family. 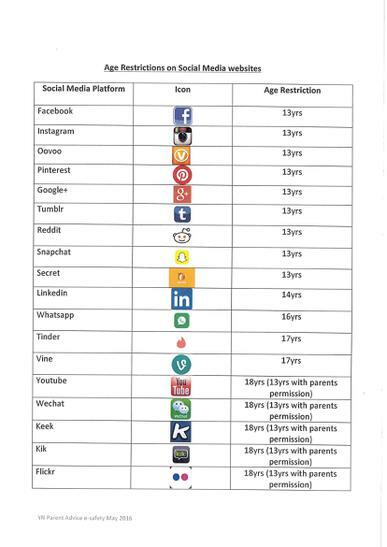 Parent Info Information on safety and privacy settings for social media apps. Hampton's Guide to Privacy Settings Follow this easy step-by-step guide to ensure you have the correct privacy settings.